Mark my words. Never get in the way of a Brit and their mixer (or whisk, cake pan or pastry bag). Brits take their baking very seriously. While the US only has one Martha Stewart, the UK has hundreds of them, dotted in towns and villages across the country. On any given weekend, they’re churning out fairy cakes and scones for village fetes and school bake sales like they’re going out of style. And those who aren’t baking (and even those who are) are watching baking shows. 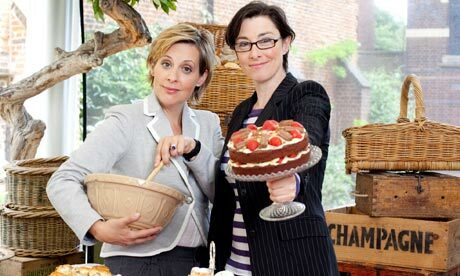 Almost 4 million viewers watched The Great British Bake-Off this month. Who knew that many Brits would find fondant icing and puff pastry so riveting? This week marks National Baking Week in the UK – a national campaign to get the uninitiated back into the kitchen to enjoy the national pastime. In that spirit, I will be baking tomorrow and will report back next week. National Baking Week runs through Sunday so it’s not too late to join in the fun. Have a lovely weekend (in or out of the kitchen)! Posted on 21, October 2011, in Food and tagged baking, fairy cakes, great british bake-off, national baking week. Bookmark the permalink. Leave a comment.